We featured a pair of post-war Voisin prototypes during our coverage of the Bruce Weiner Microcar Collection. As wide and as complete as that collection was, it didn’t have one of these. 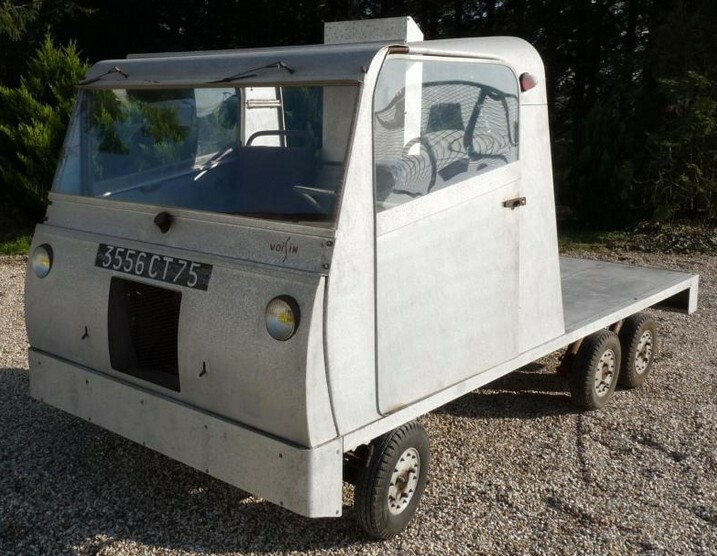 This trucklet is a testament to the changes in France between the 1930s and 1950s. Pre-war Voisins were extravagant as can be. This is about as utilitarian and as basic as can be. Voisin exhibited this very vehicle, the prototype, at an auto show in France in 1957. As you may know from the other Voisin prototypes, no one wanted them and they weren’t put into production (at least not in France, anyway). This car uses a 200cc single-cylinder engine, weighs in at 400kg and can carry 500kg. It is also front-wheel drive. A man who knew Gabriel Voisin and who saw this car on the auto show stand in 1957, contacted SNECMA, the company that Voisin worked for and owned his post-war prototypes, and asked if there was anything he could get. They told him “come take this little truck that’s taking up space in our warehouse.” Well, sort of. He was able to save this truck though, which is nice because it is likely the only one like it. It should sell for between $13,000-$19,500. Click here for more info and here for the rest of Osenat’s auction lineup. This entry was posted in Uncategorized and tagged 1957, auctions, camionnette, cars, classic cars, osenat, prototype, voisin by ClassicCarWeekly. Bookmark the permalink.